I’ve been knocked flat by a cold. I do mean I have literally been knocked flat – getting out of bed requires a monumental amount of effort. I need some chicken soup, but I need to be able to make it without having to stand up for too long, because that gives me the coughs. Obviously, my slow cooker is going to save the day; recipe inspired by Eating Well. Because what could be better for your breathing than lots (and lots) of Asian spice? In a large deep skillet, heat olive oil over medium high heat. Season the chicken with salt and pepper and sear in the pan, 3-4 minutes on each side, to maximize chicken flavor. 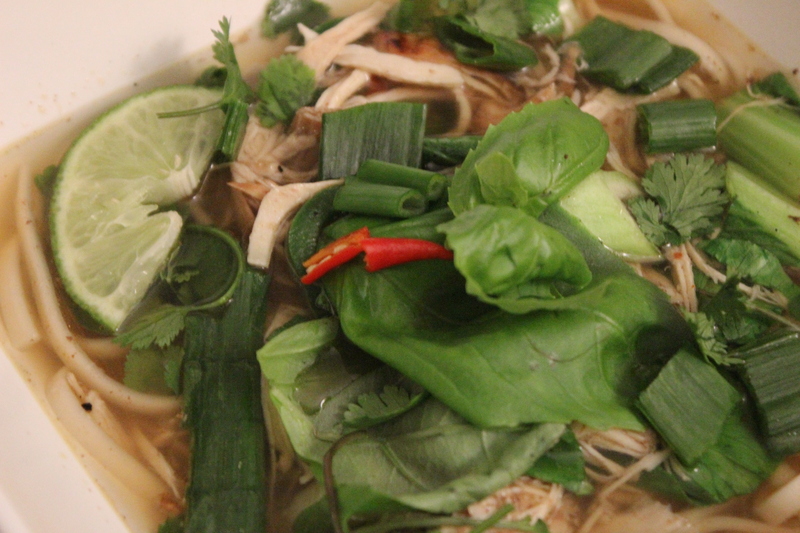 In your slow cooker, combine ingredients starting with the broth and going through ginger. Give it a quick mix and then add the chicken, meat side down. Cook on low for about 7 hours. Take out the chicken from the slow cooker, and remove it from the bone. (Optional step: strain the broth for the star anise, so you don’t accidentally bite down on them later.) When slightly cooled, shred, and add back to the cooker for another 20-30 minutes. With about 20 minutes to go, boil water for your udon noodles and cook according to directions. With about 5-10 minutes to go, add the bok choy to the slow cooker and give it a stir. 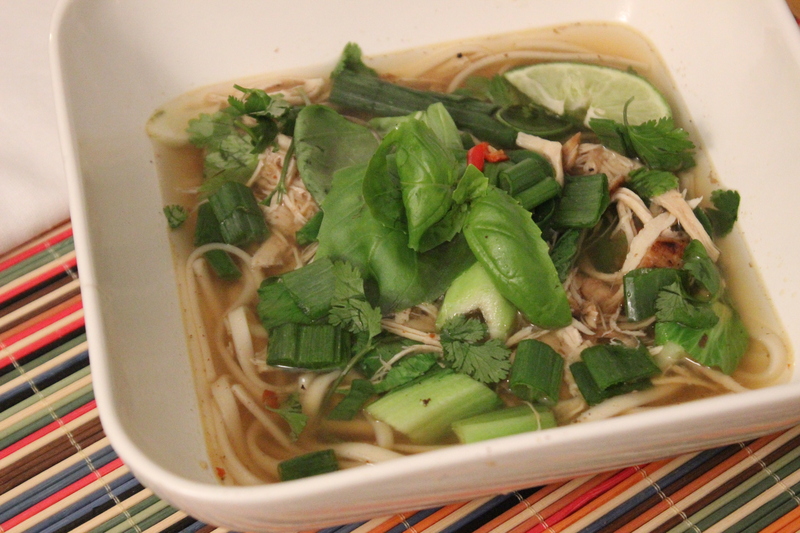 Place noodles in a bowl and ladle the chicken soup over the top. Serve with your desired toppings – big handful of herbs, sriracha, lime juice, anything that sets your mouth on fire. The crunch and spice of the basil, cilantro and scallions at the end are a must. This was the first thing I’ve actually tasted in a while, so you know it tasted good. Anything with this much heat is bound to clear up the sinuses, at least for a little while! That being said, the Husband really dug this, too…though he thought it might be better with a little less star anise. Would love feedback from anyone who gives it a go!